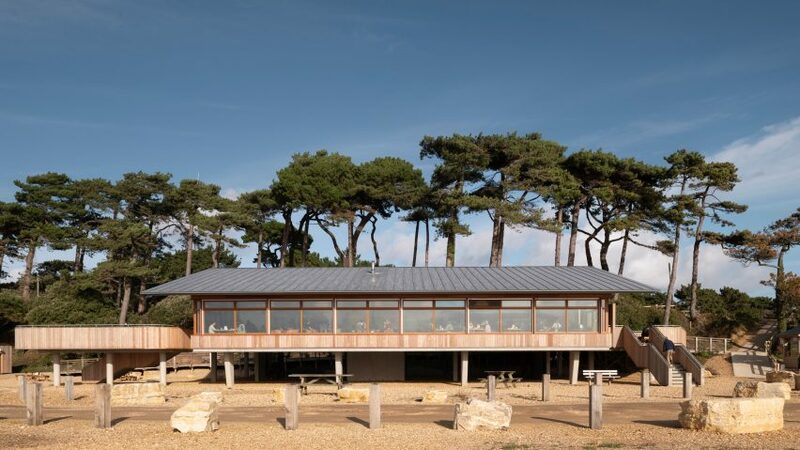 The Lookout on the English seaside, designed by Hampshire County Council, has a slender mono-pitched roof and concrete fins that shelter it from the "beautiful and brutal" elements and rising sea levels. 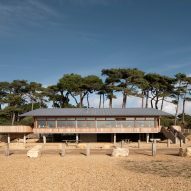 This visitor centre and restaurant was designed by Hampshire County Council's Property Services to improve the experience for visitors to Lepe Country Park on the England's south coast. 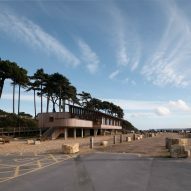 The Lookout replaces an existing cafe and visitor centre, which was threatened by the encroaching sea level. 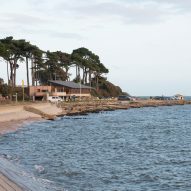 Its narrow site is flanked by trees behind and looks out across the Solent straight towards the Isle of Wight. It's design and material palette are informed by its context and the harsh seaside climate it needs to withstand. 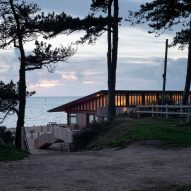 A row of concrete fins raise the occupied areas 2.5 metres above the beach to mitigate against the rise in the water level expected in the next 100 years, while the large mono-pitched roof provides shade and protection from the elements. 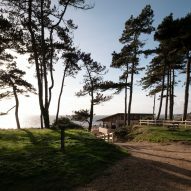 The building accommodates a restaurant, visitor information point, staff offices and supporting facilities, providing a recreation space capable of handling almost half a million visitors per year. 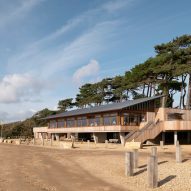 "Restricted to a narrow margin of land ownership at beach level alongside the original cafe, [the building's] location tested both planning policy and the technical expertise of the designers and engineers," said the council's design manager, Martin Hallum. "From the outset it was important that the building had composure in an environment that can be both beautiful and brutal." 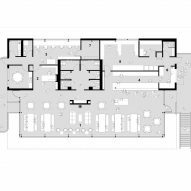 The centre comprises two connected volumes, with a simple box at the rear containing service areas including offices, a meeting room, a visitor information point and the restaurant's kitchen. 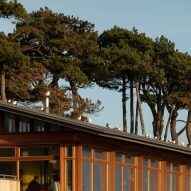 A more open area at the front of the building contains the restaurant's seating area, which looks out across the beach through a large band of windows. This space is topped with the sloping roof, which shelters clerestory windows providing a view of trees to the rear of the site. 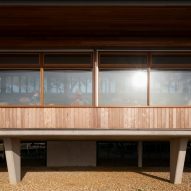 The restaurant area connects at either end with east and west-facing terraces that are lined with curving timber balustrades and provide opportunities for outdoor dining. 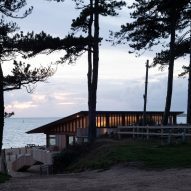 "The loosening of the straight line geometry of the external terraces responds to the more natural wavy edge to the sea and provides elegant, nautically styled platforms to which we could land stairs and timber boardwalks," the project team added. 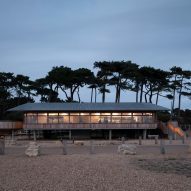 The wooden cladding that wraps around the terraces also lines the stairs and covers some surfaces of the two main volumes, as well as a separate toilet block at beach level. 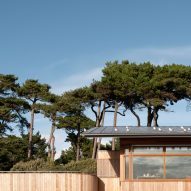 As an island country, Britain's extensive coastline provides architects with plenty of potential for hardy yet beautiful buildings. 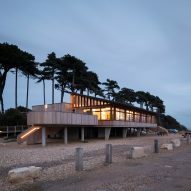 British architect Lisa Shell designed a cork-clad cabin on stilts for an artist's retreat that's only accessible when the tide is out, and dRMM won the Stirling Prize with its restoration of Hasting's wooden pier.